Review current and forecasted fees and tuition charges for Brown Mackie College - Phoenix, and just how these prices contrast to nationwide and regional averages. Get a good understanding of the tuition charges associated with Brown Mackie College - Phoenix in order to plan effectively for 4-6 years. Check out the numbers following to know how Brown Mackie College - Phoenix's price measures up to other colleges and if you need to prepare for a rise in tuition. How do Tuition & Fees at Brown Mackie College - Phoenix Measure Up To Other Colleges? The following table shows how Brown Mackie College - Phoenix compares to other colleges nationally, regionally and by state. In the 2017 - 2018 academic year, full time students at Brown Mackie College - Phoenix were billed $12,492, before adjustments for financial need. Of this amount, the price of tuition totaled $11,592. $900 was fees. Regrettably, this college doesn't offer any reductions to students who live in state. Tuition and fees take care of the expense of attendance for one year of school, but do not include room and board, which is an extra charge you will incur if you decide to stay on campus. Bear in mind many students obtain financial aid and scholarships that decrease their total cost. How much does Brown Mackie College - Phoenix cost per credit hour? Tuition and fees at Brown Mackie College - Phoenix have not changed significantly over the past 5 years. We predict the price of tuition and fees for this year will be $12,501. If costs continue to remain stable, two years here will cost you $25,010 and four years will cost you $50,056. Furthermore, you may have extra expenses such as room and board, transportation, and books. 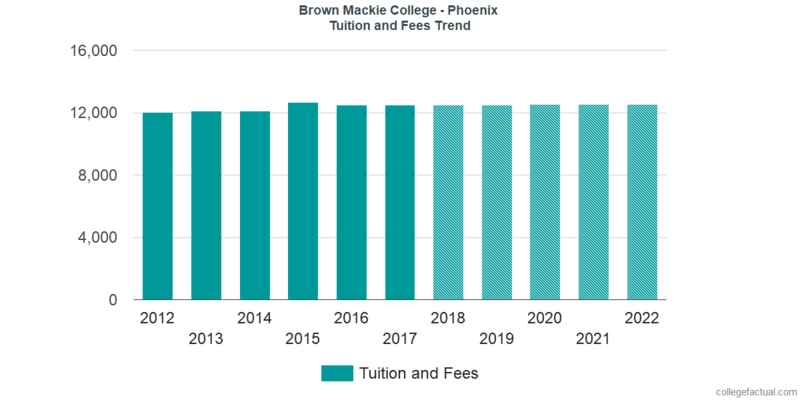 The following chart shows projected upcoming tuition and fees for undergraduate students at Brown Mackie College - Phoenix. Be aware of just how much the tuition and fees are increasing yearly. At a lot of colleges students will wind up paying a greater price for their last year of school than they did for their first.